The most important way to get plugged into the life of our congregation is to become involved in a Community Group (CG). These are places to grow as disciples of Jesus by cultivating our relationship with God and friendship with others. Click on the image below to find a West Side Community Group near you. You can use the filters to select a group that meets at a time/location that would be easy for you to attend regularly. Contact westsidecg@redeemer.com if you need further assistance. Interested in leading but not sure what to expect? Learn more here. Already leading a group? See leader resources. A community group is a place that helps you grow as a disciple of Jesus by cultivating your relationship with God and friendship with others. It is within these small communities that men and women can build personal relationships and encourage each other in practices that support our spiritual formation. Community groups also welcome those exploring Christianity who would like to experience what community life is like within the church. Composed of 6 to 12 people, groups meet in homes throughout the city. All groups are led by trained lay leaders from our congregation who receive continued oversight and support from our pastoral staff. Groups generally meet two to four times a month for worship, Bible discussion, fellowship and prayer. Many groups also participate in monthly service projects or social events in place of one regular meeting. These groups provide sanctuary from the pressures and anxieties of life in the city and facilitate the formation of new friendships. Community Groups are places where we can be revitalized and strengthened as we seek to reflect the love of Jesus Christ to our fellow New Yorkers. As God made us for community, we need others to help us apply the gospel to our lives. Our hope is that everyone who attends our church will be involved in a Community Group. We have many groups that you are welcome to join at any time of the year. Find a group near you. New members: There is no need to be nervous about your first meeting! Everyone will be new to the group. Community life: It is easy to feel lost in a bustling city and disconnected in a large church. As a member of a Beta Group, you will be part of a smaller community, allowing you to build friendships with a group of people who grow to know God together and care for each other. Registration for Beta Groups occurs every fall. Find a group near you. Contact westsidecg@redeemer.com for more information. Questioning Christianity Groups are informal discussion groups specifically for people who are curious about Christianity. They provide a forum for people to openly and respectfully discuss foundational topics about Christianity and explore deep questions. Here you can process your questions with others who may be asking similar questions and learn how the claims of Christianity relate to everyday living. Questioning Christianity Groups are geared toward people who are in process with the Christian faith. They are designed to be a respectful, moderated dialogue. Sign up here. There are multiple Moms’ Groups that meet on the West Side. The purpose of Moms’ Groups is to create an environment of prayer, worship, Bible study and connection, renewing us in the gospel so we can effectively serve our families and our neighbors. Groups include weekly Bible study and prayer, Moms’ Nights Out, playground dates and other special events. Childcare or children’s classes are provided. Moms' Groups follow the school year calendar and are available for sign up September through June on our online map. If you have questions or are interested in participating in a group, please contact westsidecg@redeemer.com. Men at all stages of fatherhood welcome. Join other dads to share ideas and ask questions about what it means to see our families formed in Christ’s image. The large group meets monthly on Saturdays with free childcare. Register here. The small group meets bi-weekly on Thursdays (no childcare available). More info here. West Side Women consists of two groups holding weekly gatherings at W83 Ministry Center. These meetings are open to all women from Redeemer and their friends for worship, prayer and Bible study to better know and experience God in community. Registration is encouraged but feel free to drop in. Tuesday 7:15 p.m. group | Register here or contact Marion Melton at mariongmelton@gmail.com if you have questions. Friday 9:45 a.m. group | Register here or contact Karen Wentling at klwentling@gmail.com if you have questions. All men are welcome to join us on Tuesday mornings at 7 a.m. each week at the W83 Ministry Center for coffee, bagels, fellowship and prayer. Our meetings are informal and no preparation is required. Registration is encouraged but feel free to come by. For more information contact Drew Melton at ajm333@gmail.com. The Diaconate OWLS (Older Wiser Loving Servants) is a gospel-centered group for adults 60 and over. Learn more about getting involved with this group here. A typical meeting would begin with some initial catching up about the week with familiar faces and getting to know new ones. Then, the leader will officially start the meeting with an opportunity for people to re-center their hearts and minds on God through worship in meditation, song, and/or prayer. This is followed by a time to reflect on and discuss the Bible text that was preached on Sunday as it relates to our lives and this city. Finally, the meeting is closed with a time of sharing prayer requests, praying for each other and for the healing and flourishing of our neighbors, city and world. What is the difference between a Beta Group and a Community Group? Community Groups (CGs) are ongoing groups that tend to have a more established core membership but still welcome newcomers year-round. Beta Groups are new, short-term CGs that ask their members to make a seven-week commitment, and most, if not all, members will be new to each other. Beta Groups begin each year in late September. Both Beta Groups and Community Groups use the same discussion guides. Start by choosing your church. 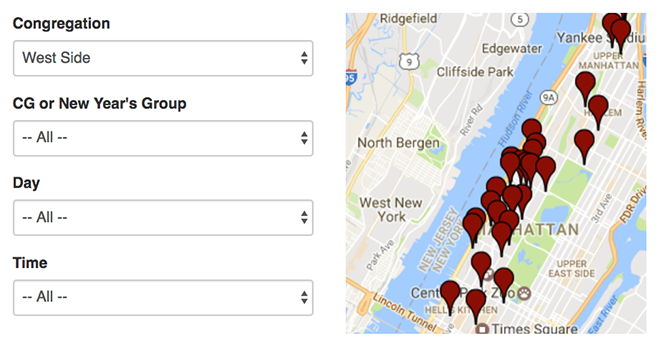 Next to the "find a group map," filter by location, time and type of group. Regular group attendance is important and beneficial for community, so try to find a group that is convenient for you. If you need further guidance, contact westsidecg@redeemer.com. Yes, we understand that you may want to visit more than one group before deciding on the best one for you. We do recommend that you visit a group at least a couple of times before deciding to try another one. If you have joined a Beta Group, we recommend that you stat with the group for the duration of its short 7-week run. Yes, you are welcome to be member of more than one group, but we have found that with the typical New Yorker’s schedule, it is often difficult to participate fully in the life of more than one group at a time. How can I find a group with people in the same work field as me? We do not offer Community Groups for specific work fields. If you would like to engage in something vocation-specific, please visit Center for Faith & Work to explore its programs. If you are a musician, you can join the Hang which is a community of fellow professional musicians regularly attending Redeemer West Side. If interested, please contact tom@redeemer.com. If you are already a member of a CG, talk to your group leader about your interest in co-leading your group or in starting a new group. If you are interested in starting a new group, please email westsidecg@redeemer.com. All CG leaders are required to attend New Leader Basics Training before leading. See lead a group for more information. If I haven’t heard back from a group that I contacted, what should I do? Please contact westsidecg@redeemer.com. While our leaders do their best to contact you in a timely manner, things happen. If you have not heard back after a week, we will be happy to help contact the leader for you. Am I allowed to join a group that is affiliated with a different Redeemer church than mine? While you are free to join any Community Group that is convenient for you, we highly recommend joining a CG that is affiliated with your church. Instead of seeing the members of your group just once a week at CG, you will see them again at worship services and other events, which provides the opportunity for deeper, stronger relationships with others in your church.